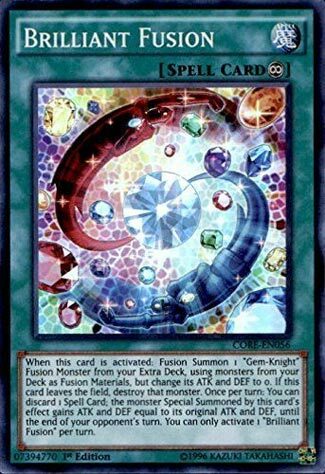 When this card is activated: Fusion Summon 1 “Gem-Knight” Fusion Monster from your Extra Deck, using monsters from your Deck as Fusion Material, but change its ATK/DEF to 0. If this card leaves the field, destroy that monster. Once per turn: You can discard 1 Spell Card; the monster Special Summoned by this card’s effect gains ATK/DEF equal to its original ATK/DEF, until the end of your opponent’s turn. You can only activate 1 “Brilliant Fusion” per turn. Brilliant Fusion became an engine in almost every deck that thought they could find the space for it. It is also an example of an engine that not everyone should run. The play is simple: play Brilliant Fusion, dump a Gem-Knight and a LIGHT, get Gem-Knight Seraphinite, get that extra Normal Summon and go from there. Outside of Gem-Knights that is the play everyone does. The decks playing this run various LIGHT monsters to combo with the typical one Gem-Knight they main for this alongside three Brilliant Fusion, but typically they are going for Trick Clown as the LIGHT. Seraphinite gets turned into a Link Monster along with another monster(s) and that’s typically it for the engine. There’s more to the card though. The pump-up effect is rarely used when you run the engine, but if you do use it, a Spell discard to give your monster its ATK/DEF back until your opponents End Phase is a great effect to have if you plan on keeping that monster brought out by Brilliant Fusion on the field for more than a few seconds. In its intended archetype, BF is a BF. Any Gem-Knight is in their reach with the added benefit of deck thinning and grave setup. The ATK/DEF drop can be managed with the discard ability of BF, and the main purpose of getting that monster is getting its effect. A great engine for a lot of decks, but not splashable in EVERY deck. Much like the plant engine and the Kaiju monsters, not everyone can run them. Brilliant Fusion is a great Continuous Spell Card that is essentially a free extra Normal Summon in any deck. In Gem-Knight decks it’s a free Fusion Summon of a neutered Gem-Knight Fusion Monster. In both decks, it fills the grave with needed monsters and provides fodder for Link Monsters or other combo plays. In addition to the Fusion Summon, which would have been enough, you do have the option to ditch a Spell Card and make your Fusion Summoned Gem-Knight have its original attack for the whole turn. Master Peace works really well with a used Gem-Knight Fusion for both it’s summoning condition or its effect’s fodder. Yeah, Brilliant Fusion will be around scoring highly for a long time. I almost did Gem-Knight Amber for a joke that I like to run with, but I rather not do something only a select few would get, lol, and the fact that I feel that Brilliant Fusion would be a more interesting card to review to represent the Gem-Knight Archetype. Brilliant Fusion is a Continuous Spell that does a Fusion Summon, bet you didn’t guess that. When activated, you Fusion Summon a Gem-Knight Fusion from the Extra Deck by sending the materials from the deck to the GY. A popular card is Seraphinite in literally every other deck except Gem-Knights by using Garnet, or any other Gem-Knight if it has better typing for you, and Trick Clown. In Gem-Knights they love to go for Lady Brilliant Diamond or Lady Lapis Lazuli to try and get an FTK off. The only downside with Brilliant Fusion is that you cannot use the hand, the card doesn’t leave the field when the most does while the monster leaves when Brilliant does, and the ATK and DEF of the Gem-Knight is 0 unless you ditch a Spell, and the return of stats only lasts a turn. With all that in mind, the negatives doesn’t outweigh the one positive this has, whether it is in Gem-Knights or any other deck, especially in Link Era. Brilliant Fusion is a good card, consider the engine if you are playing a deck that relies on Normal Summoning, and you must play 3 in Gem-Knights.